Cyclists Beware! Japan Considers Roundabouts. Japan's Ministry of Land, Infrastructure, Transport and Tourism formed a panel on September 24 to perform a feasibility study into introducing roundabouts to Japan. Proponents of roundabouts in Japan argue that in the event of an earthquake disabling signals traffic can continue to flow. So lets go screw up out transport infrastructure, forever, for those very rare occasions that earthquakes take out our signals. Or we could forgo the much hated infrastructure and simply teach our motorists to give way to the right at uncontrolled intersections. They also point out that roundabouts allow vehicles to flow smoothly when there is no traffic ahead, and that there is no need to come to a complete stop at an intersection if the road is clear. Roads in Japan are rarely clear, and roundabouts restrict the number of cars that can enter an intersection severely backing up traffic at busy times. Tokyo has nothing but busy times. Traditionally cyclists and roundabouts have not mixed well, with numerous studies concluding that roundabouts place cyclists at greater risk than conventional intersections. Cyclists are at risk when entering the roundabout, they're at risk when cars enter the roundabout, and also risk being struck as cars exit the roundabout. In fact it is worse than that, with a recent study showing that a single lane roundabout creates an environment with 24 conflict points while drivers are expecting just 4, leaving them blind to 20 potential accident spots. Lets hope this panel of "experts" do their homework thoroughly, considering bicycles and pedestrians, not just motor vehicles, in their roundabout strategy. They must keep in mind that bicycles are legally classified as light vehicles in Japan and required by law to travel on the road, therefore any infrastructure decisions that do not take into account the needs of cyclists are grossly negligent. 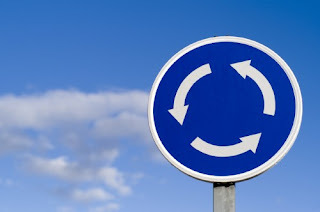 Currently the panel is simply compiling a report about reductions in accident rates and social changes that have occurred in countries that have introduced round abouts, therefore it still remains to be seen if roundabouts will start popping up around the country. Lets hope not. There actually are bicycle-friendly roundabouts in Holland. Cars have to yield to bicycles and pedestrians. If the bicycles are also going in the direction of traffic (which they're supposed to be doing, I personally think all salmoners should be run over on sight) they can be easily seen and avoided by any car entering the roundabout. I would think any car in the roundabout would either be behind a bicycle or going faster than a bicycle and wouldn't have any trouble exiting the roundabout. I absolutely hate the normal traffic intersection with traffic lights. When making a left turn with my car, I have to worry about bicyclists on the sidewalk coming from three directions, my direction, the opposite direction, and the mamachari that is bicycling straight at me that I think will stop at the red pedestrian light, but then veers left right in front of me onto the pedestrian crosswalk as I try to complete my left turn. That is really annoying. The difference between Holland and Japan is that Holland designs infrastructure with bicycles in mind. In Japan bicycles will be an afterthought if they're considered at all. The UK/USA style roundabout is a killing machine for cyclist. The Dutch style roundabout is a safe haven. The key difference is the intersecting angle. The Dutch road enter a roundabout at right angle (90 degree), which force entering motorists yield to the traffic in the round about, including cyclist traffic along the outer round. The UK/USA road enter the roundabout at tangential angle to merge with the traffic inside the roundabout. However that makes it very dangerous for both motorists and even more dangerous for cyclists going into the same space.